A gripe of a number of local residents and business owners is the number of properties sitting empty in Fremantle, but Dr Pettitt said the new app Why So Empty, developed by Spacemarket and the Australian Greens, could provide a new way to combat this. ‘This app has the potential to be a major part of the solution for Fremantle’s retail and commercial challenges,’ he said. The release of the app comes a few weeks after the City of Fremantle and Fremantle Chamber of Commerce began discussions to come up with solutions to halt the trend of arts groups leaving the city. ‘I don’t believe there is a decline in the arts but there certainly is a huge demand for more spaces for artists to work, live and exhibit in and this has the potential to provide some more of these spaces in Fremantle,’ Dr Pettitt said. 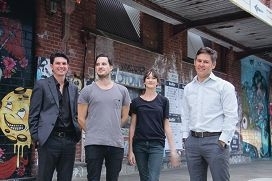 The app allows users to find vacant buildings that are suitable for commercial, creative or personal use and includes Fremantle buildings in Collie Street, Adelaide Street, High Street and the Woolstores building. Greens Senator Scott Ludlam, who helped develop the app, said it was an important area that needed addressing. ‘The idea of the app is to bring jobs and enterprises back into towns like the City of Fremantle,’ he said. Visit www.spacemarket.com.au/why|soempty for more information.